A site for foreigners living in Cheongju city! This website was created as a guide and reference for foreigners living in Cheongju, Korea. For newcomers, our aim is to provide all the basic info you need. For those who already know their way around the city, we hope to give you some new ideas on things to do and places to go. To keep it as up-to-date as possible, we need your help. Please use the form on the Contact page if there is any new information you'd like to add, any mistakes you see, or any questions you have about the city that will help us expand this site. Cheongju has an active and welcoming foreigner community, so explore, make connections, participate, and enjoy life! Cheongju (청주, "chuhng-joo") is a city of 800,000 in the middle of South Korea. It is the capital of its province, Chungcheongbuk-do (충청북도, "choong-chuhng-book-doh"). It is home to six universities (Chungbuk National University, Cheongju University, Cheongju National University of Education, Seowon University, Chung Cheong College, Korea National University of Education), as well as the Air Force Academy and the president's summer home. It is also noted as the origin of "Jikji," the world's oldest book made using movable metal type in 1377. 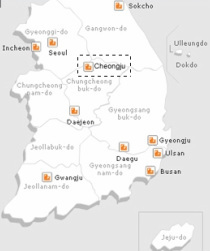 The city is divided into 4 districts, called "gu" (구), and 30 neighborhoods, called "dong" (동). When describing where anything is located in the city, people will say what "dong" it's in. Here is a map of Cheongju showing the different neighborhoods and important places. This file is a little blurry when zoomed in. For the actual paper version of this city map (which is much easier to look at), go to the Tourist Information Center in the small building next to the Intercity (shi-wae) Bus Terminal. For any questions you have about Cheongju, you can call 1330. (For Cheongju-specific info, add our area code 043-1330) This is a helpline where they speak English, and they can help you with a variety of questions. Rainy Season: July and August have quite a bit more rainfall than other months-- about 285mm/11in each. We have a great big group of foreigners with a variety of interests and activities, and there's always something going on to join in on! Take a look through this site to get an idea of what the city has to offer. Also, make sure to join the Facebook group What's Going On in Cheong Ju? to keep up on all the events and daily happenings. Getting Oriented: If you're interested in the layout of the city, and to help better orient yourself, you can go to the Tourist Information Center. This is a small building just to the left of the Intercity (shi-way) Bus Terminal. They have maps and tourist brochures about the city. They also have English-speaking staff if you have questions. Immigration Office: You will want to make a trip to the Immigration Office fairly soon to get your ARC (alien registration card). The Immigration Office (출입국관리사무소, "chool-eep-gook gwalli sah-moo-soh") is near the bus terminals. You will definitely want a Korean co-worker to go with you, as not many of the staff speak English. Once you have your ARC card, you can get a phone and a bank account!